Italian mercenary Francesco Bussone da Carmagnola was beheaded on this date in 1432. 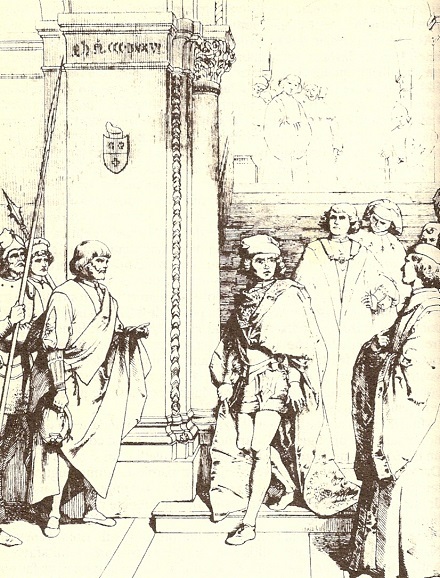 A successful condottiero was defined by a mixture of battlefield success and cutthroat scheming, and it was his clumsiness with the latter that did in Carmagnola. 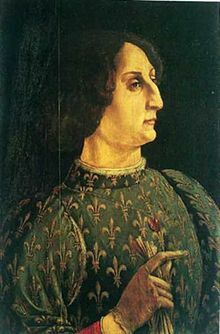 His name denotes his origin, from a town in the Piedmont where despite his low birth, his talents raised him to a command for Filippo Maria Visconti‘s brutally successful campaign* to reunite his father’s divided patrimony and make the Duchy of Milan a peninsular power. So you might think that Carmagnola stood to reap ample rewards for fastening himself to a rising star. But Visconti, perhaps fearing the prospect of a subordinate accumulating enough power to mount a coup d’etat, used a niggardly hand with the emoluments that his general was anticipating — and this led Carmagnola to ditch the Duchy and make an arrangement with its rival, Venice. The turncoat had the satisfaction of smashing his former Milanese mates at the 1427 Battle of Maclodio, a battle that helped to achieve for Serene Republic its largest-ever Italian territorial expanse. But his failure to follow up the victory aggressively soon tested the patience of his new patrons. After a short interval of peace, Venice resumed war with Milan in 1431, and here Carmagnola dilated unacceptably (Italian link), failing to advance on Cremona and instead proposing to winter his army — in August. The Venetian Council of Ten also caught wind that Carmagnola was maintaining a secret correspondence with Milan and exploring the prospect of changing teams yet again. Determined to have done with the snake, it summoned him back to Venice under the pretense of convening a war council for the 1432 campaign season. He arrived to find that it was too late in the day to meet the Doge, but as he started for his gondola to retire one of the Venetian gentlemen who had been sent to meet him instead directed his steps away. “That is not my way,” Carmagnola objected. He was beheaded as a traitor between the scenic columns of San Marco and San Todaro. His widow returned to Milan and eventually repatriated the late commander’s remains to his native soil. * Carmagnola left a nasty legacy to the world’s architectural heritage during this time by collapsing the Trezzo sull’Adda Bridge, the widest-spanning single-arch bridge ever built before the industrial age.